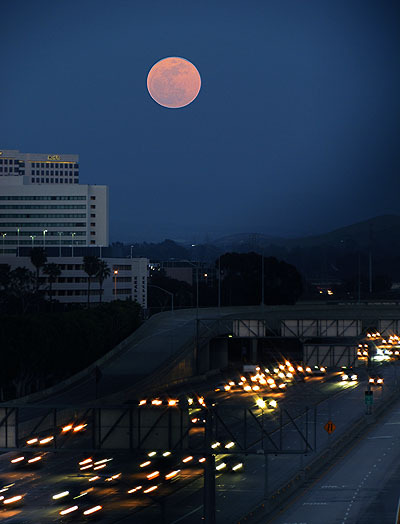 While Will Femia was busy trying to figure out if he could get a picture of tonight’s supermoon rising along 42nd Street, I decided that here in Southern California it would be appropriate to get a picture of the supermoon rising over a freeway. In the end, it turned out that the angle was off by a couple of degrees, so I couldn’t quite do it with the shape of the San Diego Freeway in my neck of the woods, but it was close! And here it is a few minutes later, rising over the treetops. It no longer has the lovely red color that the haze near the horizon gave it, but since I’m not shooting from a freeway overpass, it’s a little bit sharper. Tradeoffs are everywhere.